Can you go into more detail regarding your indigo fermentation vat? Can you share your recipe? this is pretty much what i did–but again, i didn’t document well and that could be part of my problem. part of it! she says to add everything again, in the same proportions, once the vat becomes exhausted. let me know how it works for you. Ohhhh a indigo vat ….. !!!! Would love to have one …. no space for that kind of thing …. I´m impressed, Patricia! I like these shades of green the best. I tryed pomegranate today and had a pale pale yellow. I´m not very patient and gifted. to pick. I will let you know. Just checked your recipe-it requires ground indigo. But the madder sounds interesting. I may try a pinch with my plants, maybe. 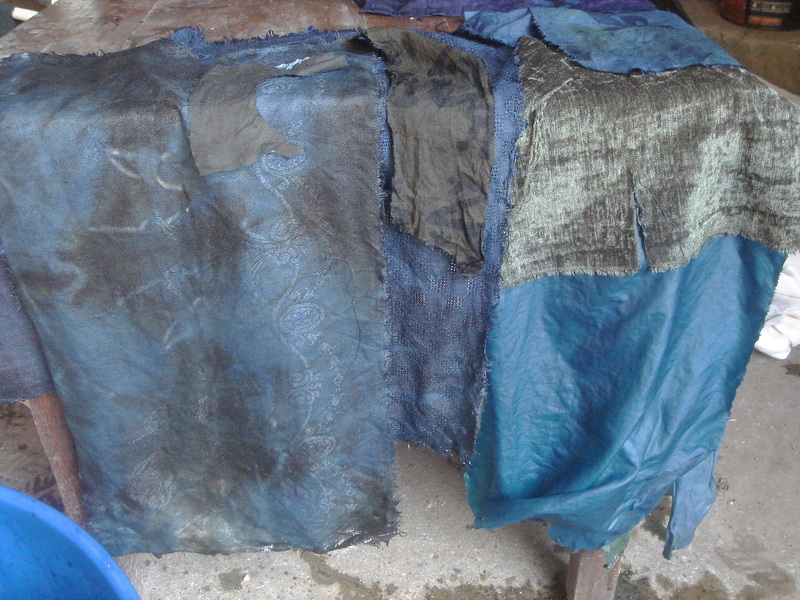 it describes processing indigo from fresh leaves. see if this sounds like something you might want to do. i tried it last year but my results were very pale. think i may have waited too long to harvest the plants–and at this rate, i might be waiting too long this year! good luck. hey Doris. i’m with you–not very patient nor gifted. last year i used tumeric to get some really amazing yellow. it was easy but very intense. 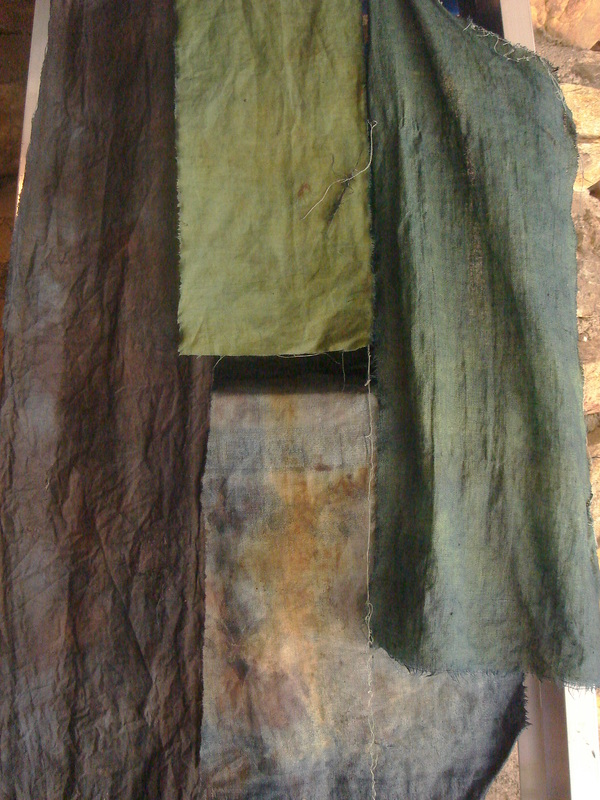 since then i’ve used black walnut to tone it down–and actually some of the greens you mentioned were tumeric yellows overdyed with indigo. glad you liked them. Luscious colors. I’m loving the over-dyeing. And I really like your earth guardian. You have such a style–I’d have been able to pick that out as yours from a big pile. I did some bright colors with Procion dyes when Jude first started talking about color, but I kind of hate them. I’m impatiently waiting under the black walnut tree for more nuts to fall. I really want to over-dye them. I did get a really nice yellow from tickseed sunflowers. I think my name should link to my blog. 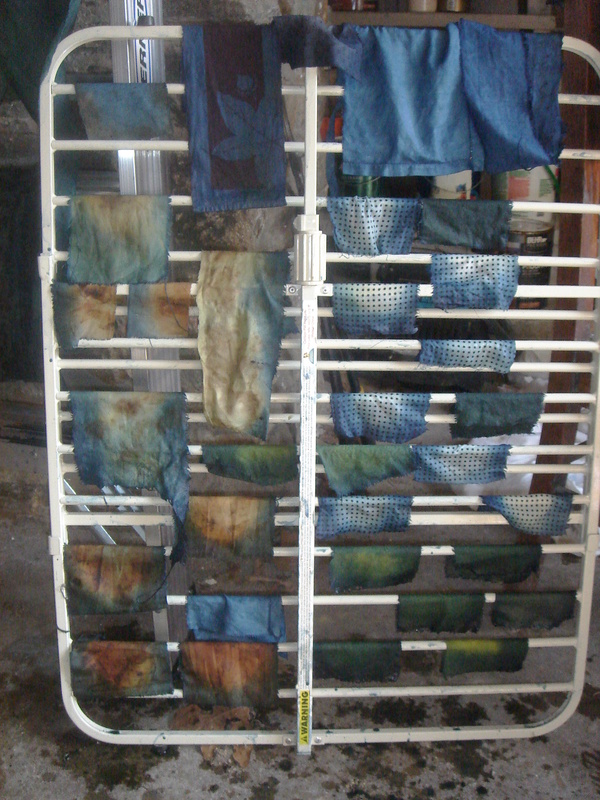 The way you show all the dyed cloths together, and hanging on the racks, it’s easy to feel into the infinite creative potential they carry. It’s such a thrill to be so excited about fabric. Can’t wait to set up my sewing room when the house is built. Thanks for the inspiration! hi there! i don’t know if you’ve explored her site yet, but Jude Hill at spiritcloth.typepad.com will absolutely light your fire! glad you stopped by. LOVE your Earth Guardian cloth! Do you have a shop these go in or are they “keepers”? funny you should ask. 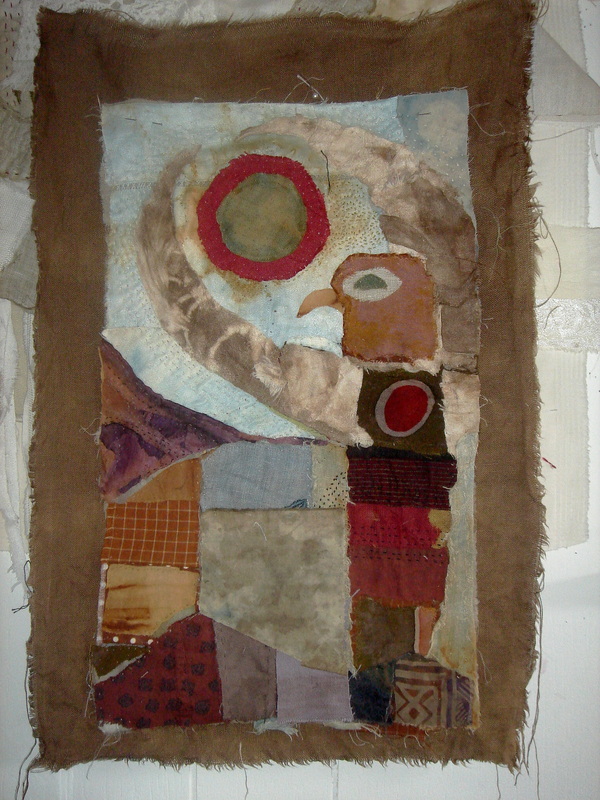 my cloth has just been juried into a gallery here in Asheville but it will be a while before space frees up there. i have a web site where some pieces are listed. and i’m glad you asked about this because i need to update it with some newer pieces. thanks Sandi. and Nancy–i’ve been visiting your site as well. haven’t left comments but feel really moved by the exploration of stones. they’re so lovely. i have such a stash of little rock beings–and truthfully they are some of my most precious be long ings. like, if there was a fire, i would grab them first! First of all, congratulations on having a cloth juried into a gallery. Well done. Is it your latest, Earth Guardian? Walnut is my favorite of all of the natural dyes; foraging for the nuts has given me such a tactile joy as do the myriad, earthy shades of browns that are created.. 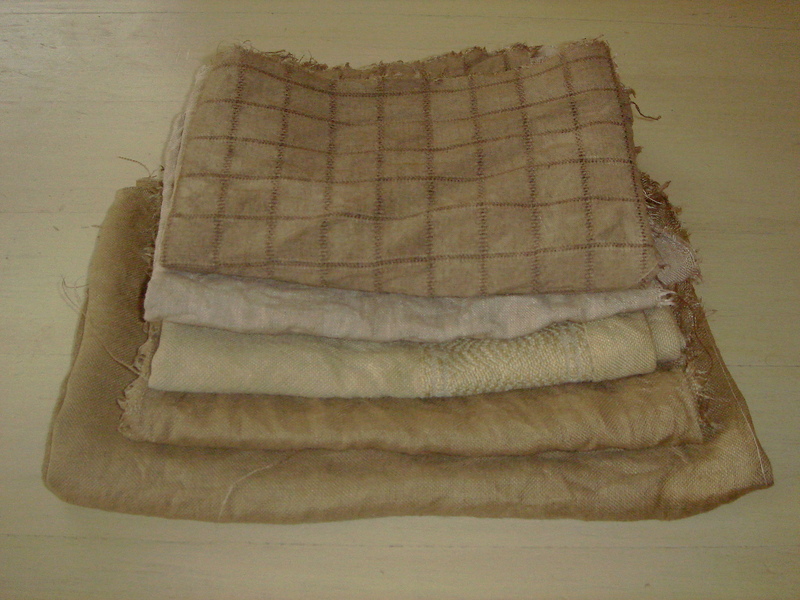 Equally, what a good feeling to see your walnut cloths, all folded and waiting. Here in New Mexico, I haven’t found any in the wild but grace has a stash and has a pot going for me. thanks, Marti. Earth Guardian was not one of the pieces i submitted. i had to send in a dvd with 5 images, an artist statement (that was interesting) and then a description of the pieces themselves. 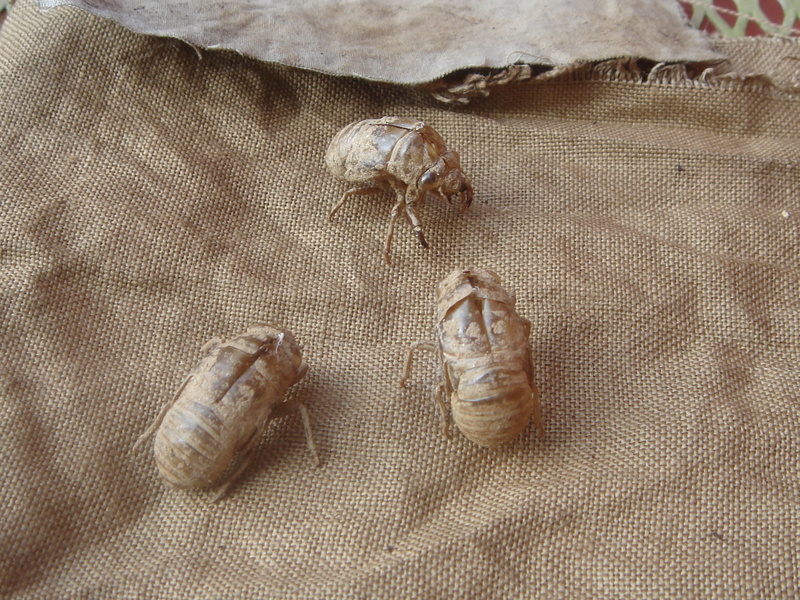 they were older pieces. ones i look at now and think, hmmmm–not finished–not quite something or other–just not THERE. wherever “there” might be. and yes, i was totally surprised. i’m with you. blk walnut i love. love everything about it. the way it stains my hands. the smell of the shell especially — and the fact that they are so plenty full here. every where it seems. i love the tree too–the lacy foliage reminiscent of pecan trees in s. georgia. the indigo in the garden right now is amazing–there’s so much of it that i’m feeling very overwhelmed. it’s blooming like crazy and i plan to harvest seeds before the first frost–but also wondering if there is a chance it self sows? i have no idea. but what i really need to do is harvest the plants and i just don’t know if i’ll get to it. these colours are delicous and congratulations on the show coming up in Asheville! the photographs are just a feast for the eyes and soul…your colors are so FINE!…. it must feel so so good to have them waiting. just so beauty Full, oh, ……..
when you hang them. please. another nuance. i can’t imagine how it would feel to have all this at Hand…. it’s an old woolworth store very nicely redone–two floors and a funky old soda fountain on one side. the good thing about it is that it is right down town and gets lots of traffic. the way it works is you apply and if chosen, there is quite a long wait list before space opens up–could be up to 18 months although the woman who called me said it would probably be about 6 months. maybe sooner. and the way it works is artists rent space–probably about $50/month and then they take 10% i think of all sales. so. it’s certainly not like getting juried into the Southern Highlands Craft Guild but still–hey–it’s a start, right? i’m thinking about display. i’ll have a wall or two. what to do with it? i don’t know yet. but will take pictures for sure. and if you have any suggestions–i’m totally receptive. and Grace. you wonder how it feels having all of this at hand. it feels the same as always. here’s something funny that happened. when woolworth walk first called me to let me know, they had confused my work with someone else’s work and said, “sorry, not our cup of tea.” and i said, “o.k. thank you.” then the woman realized she had called me but had meant to call another person–quickly apologized and said she’d call right back. which she did. explained the confusion, apologized, and said, “yes, we would like you to display here.” i said, “o.k thank you.” it seemed like either way it was just fine. and either way, it didn’t touch some core place in me. gahhhhhhh. does this make ANY sense? and then…love the story about their cup of tea, mistaken identity. to shore up your personal household economy nicely. i am going to watch anything you write about this with great interest. the Highlands Guild comes looking for you right away. ha. you make me laugh. the thoughts of the Guild looking for me. oh Grace. love you! what wonderful results with your dyeing! I keep seeing what people get from walnuts and thinking, hmmmm, keep a lookout; but no luck so far. 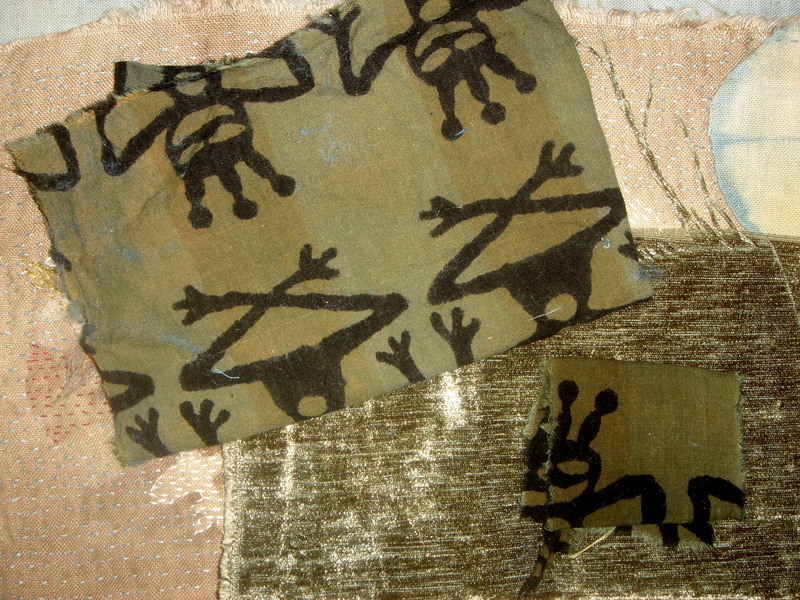 you’ve got some great fabrics there; e lovely to see how they become textile pieces of art. 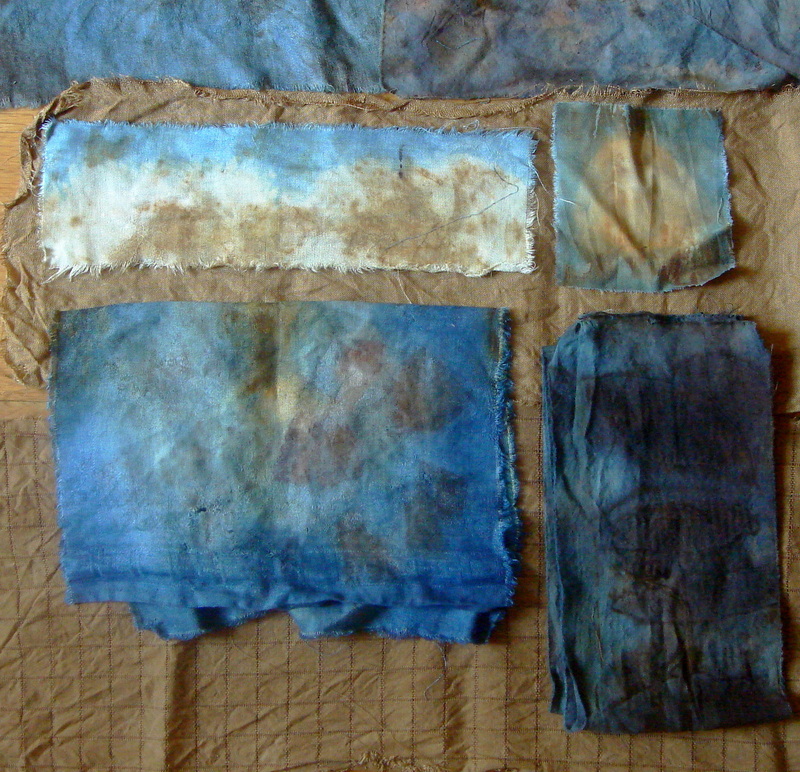 I’ve done some fabric dyeing with woad this summer; just added urine, and away it went! VERY smelly!! but wonderful results. soft blues. I (tie-)dyed a cotton top and some loose cotton linen fabric. 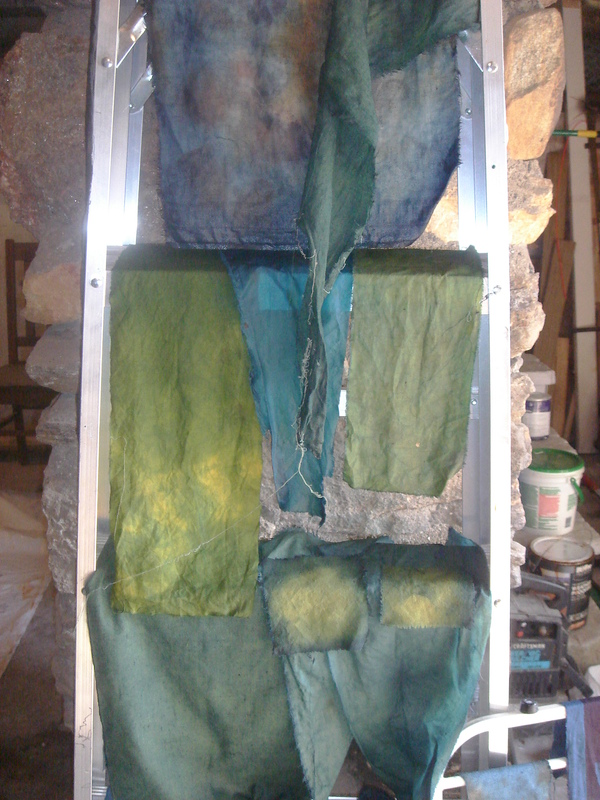 got another folded piece in, as the dye-bath is getting used up. see what happens. hi Jan. great that you stopped by all the way from England! what nut trees grow there? i’m noticing hickory nuts and shells on the ground now and am tempted to see what they yield. and this spring a neighbor gave me a woad plant he bought at the annual herb sale. it grew nicely but i haven’t done anything with it. hoping it will come back next year. thanks for your kind comments about this cloth. do you have a blog? Nice dye results Patricia. Loved the story about the fed x guy. I think every person who has dyed naturally, has done that same thing. I know I have. I have been traveling around the North East for a few weeks and am collecting nuts, seeds and leaves from all over. Can’t wait to throw them in a pot and see what happens. hi Cathie! just checked out your blog. so, you’ve been on the road, collecting as well. would love to know where you were in WV. and yes, the FedEx guy. the stories he will tell! Hi Judith. I wonder if you can help. Please. This weekend I made a dye bath from indigo plant. I placed in a 1/2 gallon canning jar about 1 lb of leaves and the rest water. i submerged the jar in a pot of water at about 160-170 degrees for 4 hours. i then strained the leaves and added a tblesoon of baking soda. Then for about 15 minutes I poured the bath from one bowl to another . Then I added a tablespoon of Spectralite ( thiourea dioxide). What I got was a lovely shade of cool green-I guess I didn’t have enough leaves to make blue. When I began to iron it the color disappeared. The heat caused it to go back to its natural color. I stopped ironing immediatey and still have some of the fabric left. anything I can do in the future to hold the color? Hi Barbara–wow. sure wish i had quick answers for you. i know last year i harvested my indigo kinda late in the season and it was very light. Jude suggested that i harvest earlier–like in July or August. have no idea if this would impact things the way you’ve described. i personally think indigo vats are tricky and unpredictable–at least that’s my experience. and that’s part of the reason i’ve gravitated more towards black walnut and black bean. you can check out this website–http://shiborigirl.wordpress.com and even take an on-line class. although i thank you for your question, i’m such a novice at this myself–and in terms of your question, sorry to say i’m clueless. but i’m sure someone has the answers for you. good luck. Sorr I called you Jude. Thank you for your quick reply. When I figure out what happened I will let you know. Have a great day! Hey Jude. I just read somewhere that the bumper crops for bw come every 5 years.